This article focuses on quilts, which were first created as early as the 16th century. It notes the various designs and the production process. It originally appeared in the November 1941 issue of American Collector magazine, a publication which ran from 1933-1948 and served antique collectors and dealers. The antique quilts which collectors admire today for their colorfulness and variety of design represent two of the oldest forms of needlecraft. They are quilting and patchwork and were known to the ancient world at least a thousand years previous to the Christian Era. Rare 18th-Century American Quilt: The delicacy of the calico appliqué motif is reminiscent of crewelwork. Diamond pattern is used in the quilting. In Europe, long before the Renaissance, queen and peasant woman alike understood and practiced both. Quilts were known in England as early as the 16th Century. One of the short-lived wives of Henry VIII was presented with twenty-three, and Mary Queen of Scots is credited with having made a quilt and bedhangings that are still extant. Just when the first quilt was made in America must remain a matter of conjecture. We find them mentioned in inventories during the latter part of the 17th Century, and it is probable that they were part of the Early-American household effects almost from the beginning. Our interest in them must remain purely academic, however, since none have survived and even those made in the 18th Century are rare. But if a quilt made by Priscilla Alden or Mary Brewster could be found, it would show the same process of making as the plentiful examples of the 19th Century. In other words, whatever the type or design, three parts were essential: the top, lining, and interlining, and these were made one by finely wrought stitches in a definite pattern. Treatment of the top fell into three classes. This important part of the quilt might consist of a plain piece of cloth with the quilting forming the decoration; it might be a plain piece of cloth overlaid with a design of patchwork or appliqué, or it might be fashioned of cloth fragments pieced together in blocks of varied size, color, and shape. Designs were legion in both the pieced and patchwork types. The pieced top examples, although the least desirable of the three types, are to be found in all sorts of interesting patterns: star, sunburst, and geometric. The bottom of the list, artistically, is the so-called “crazy quilt” which is pieced from all sorts and shapes of cloth fragments scrambled together without regard to shape, color, or design. The quilt with a patchwork top, that is, a floral or geometric pattern superimposed on a white background, lends itself to a variety of designs, many of them comparable to crewelwork, with cloth instead of thread as the medium. 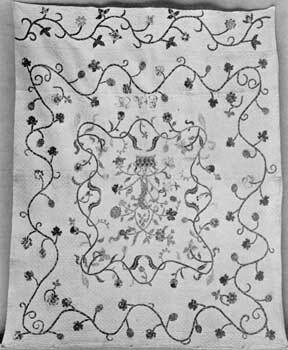 Very much like a crewelwork pattern is the example shown here, which was made in Virginia in the late 18th Century. Here, against a diamond-quilted linen ground, a floral design of brown, blue, and light red calico is applied. The monogram E.A.M. was that of Eliza Armstead Miller of Richmond, who was a cousin of Patrick Henry. Incidentally, from 1700 to 1870 calico was the favored material for patchwork or appliqué motifs. Most desirable but very rare is the all-white quilt with decoration achieved solely by quilting. Here, every inch of the material was quilted and the main design was often brought into relief by stuffing the most prominent features. These quilts date from the late 18th to the early years of the 19th Century. A latter-day machine-made imitation of them was the Marseilles bedspread of the 1890’s. As already stated, quilts made before 1800 are comparatively rare. But as the height of artistic excellence was reached during the first half of the 19th Century, there are many fine examples in existence for the collector to acquire. As with other forms of folk art they reflect the economic, political and social conditions of their day, especially the patchwork types which bear such names as Whig Rose, Wagon Tracks, Texas Star, Road to California, and Dolly Madison’s Star. Whatever the design, the tops of all quilts were planned and made by the women of a household, then laid flat on interlining and lining, basted around the edges and set up on quilting frames which were part of the equipment of every well-ordered house from the Atlantic Seaboard to the Mississippi and beyond. Sometimes the housewife did all the quilting in her spare time. More often, two or more quilts were set up at a time and so made excellent excuses for the sociable quilting bee. Brilliant – can,t read enough about quilts. Keep making them, love them, and keep collecting them and want to know everything I can about them. Thank you for an excellant site – will keep coming back. “ ” It’s only after you get it home and do your research that you know if you’ve hit the jackpot—or overpaid.